After you have polished a floor or other surface, you need to objectively evaluate the gloss in order to determine if the job is done. You will probably want to compare various sections and remove any unevenness in the gloss. From your own experience, you may already know that it is actually quite difficult to accurately evaluate how shiny a surface is. Well, this gloss meter resolves that problem. 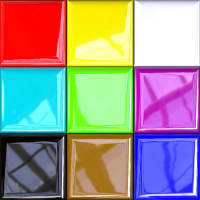 In just one second it reads and assigns a value for the surface gloss and displays it for you, with no questions asked. The gloss meter is a powerful tool that objectively ensures the quality of your work. Also you can prove your quality work by showing this number to your customers or supervisers. 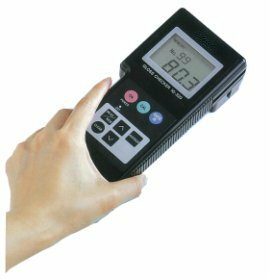 For measuring surface gloss, the handy gloss meter IG-320 is just the right tool. This measurement apparatus originally developed to measure the gloss on a variety of surfaces. Currently, this product is being utilized to evaluate masonry finishes, floors, stone surfaces at the factory, molding, coated surfaces, printed matter, paint and ink, leather, rubber, ceramics, film, etc. The IG-320 gloss meter measures gloss and displays the results as numerical data, in one second. 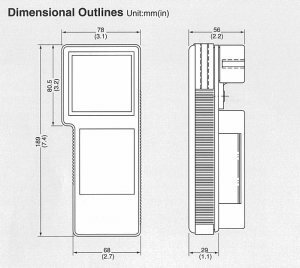 It eliminates subjectivity and helps guarantee uniform production quality. The IG-320 enhances product reliability in all kind of situations and can be used for quality control purpose as well. The gloss meter encapsulates high performance along with easy measurement and calibration all in one compact hand held tool. It is easy to hold and operate with one hand, and is light enough to carry around. All you need to do is place the meter on the surface you wish to measure, press the button, and it is done. The number indicating the gloss is displayed instantly and can be stored in the meter's memory. 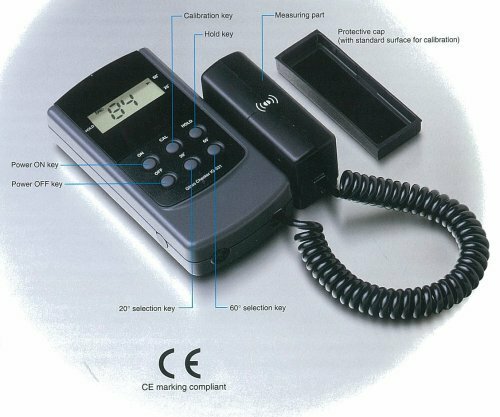 The IG-320 provides high-precision measurements and allows users to gather data or view averages with a single touch of a key. The compact, lightweight design is ideal for production line and outdoor applications. Because the degree of gloss varies depending on the measuring point, multi-point measurement is necessary for achieving the highest accuracy. The gloss meter is ready to store up to 99 readings and these values can be averaged and automatically stored in the memory by pressing the "Average" key. It's as simple as that. No warm-up is needed before measuring gloss. Just push the start button. The gloss meter's calibration is automatic. By simply placing the optics onto the sample surface, gloss value is displayed in real-time. No special skills are required. The portable IG-320 has a compact configuration and weighs only 400 grams (0.88 pounds), yet it is extremely durable. 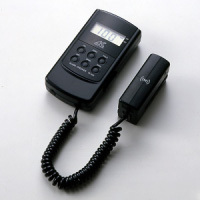 It is powered by a standard 9V battery, and an alarm tells you when it is time to change it. The gloss meter IG-320 comes with a soft carrying case and lens cloth as standard accessories, all at a very economical price. 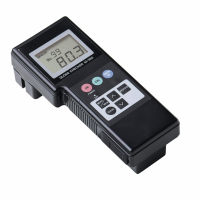 These handy gloss meters will prove to be invaluable across a wide range of industries. Examples for potential applications are. Checking surfaces of leather, rubber, ceramics, film, etc. 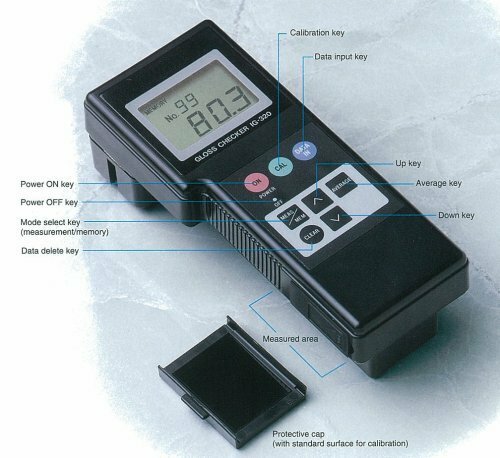 The IG-331 gloss meter is designed for ease of operation, and to improve quality control inspection in various industrial applications. The flexible, remote connection of the probe to the display unit ensures greater efficiency and safety in all applications. For corner or aperture place this gloss meter will surely be effective measuring tools. Also, this model enables easy switching between measuring angles (60° or 20°). Choose 60° for standard gloss measurements. For high-gloss surfaces with gloss values over 70, simply switch to the 20° measuring angle. The selectable angle feature makes it easy to measure glossy surfaces. Just press the calibration key (CAL) to start the automatic, sequential zero-span calibration.